Capacity 12 - 22 qt. Lock in freshness with this Cambro RFSC12148 snap on cover! 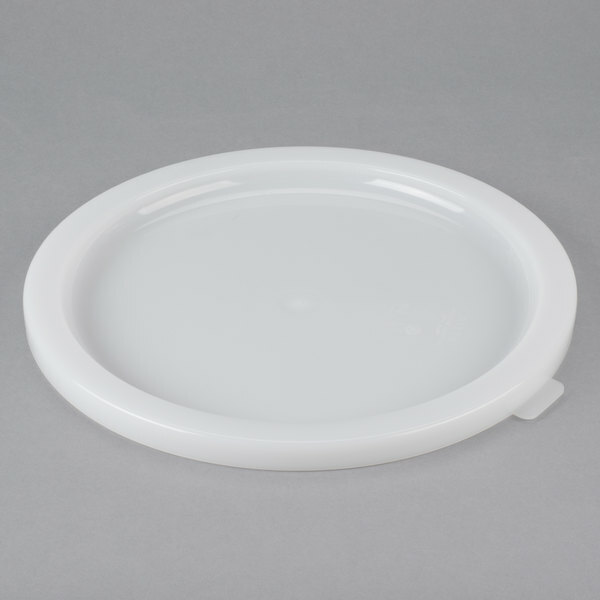 This tight fitting translucent polypropylene cover is for 12, 18 and 22 qt. round, white storage containers and is a direct replacement for the DSPR6 6 gallon beverage / juice dispenser's lid. Its tight seal works to keep foods and ingredients uncontaminated and organized for your convenience! Perfect addition to the 12 quart Cambridge round storage containers. I'm so glad that I invested in these containers. They keep items fresh and store so neatly. These work great, snap on tight and do not leak. Make sure you get the matching lids to your tubs not all brand fit each other. 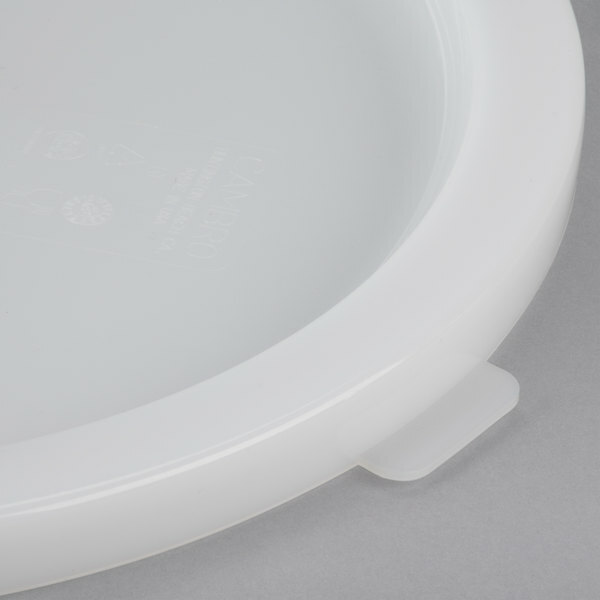 You can really tell the level of detail in something very simple such as these lids. 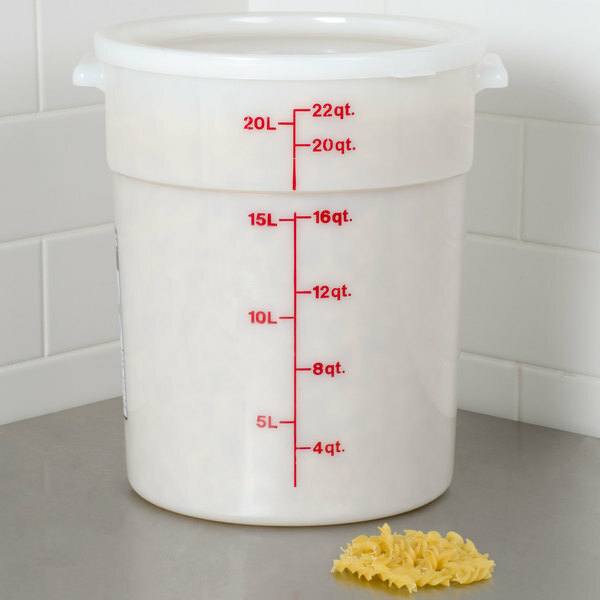 I’ve only used home kitchen grade containers and lids but when I finally started using these by Cambro my life was completely changed. 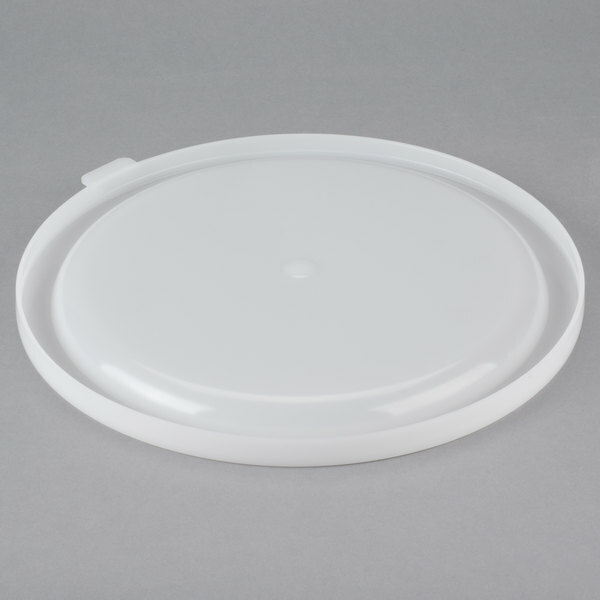 Great sturdy lid that fits on the Cambro 22 quart bucket we use for pizza sauce, Cambro makes some of the best jitchen plastics in the business. This is easy to clean. The product is as listed on the website and is of good quality and the right price compared to other websites. Would purchase again if needed. We love these bucket lids. We have over 25. They hold up so well. Haven’t had one break yet. Over a year using them and they live in my walk in fridge! These lids fit the corresponding Cambro storage containers very tightly. We use these for ice cream and coffee bean storage. They are heavy duty but still lightweight. very good item. now i love to see my kitchen nice and organized, dried storage and walk in refrigerator. definitely will recommend this item to my family. Has a tight seal, works well with the matching 22 Qt container! 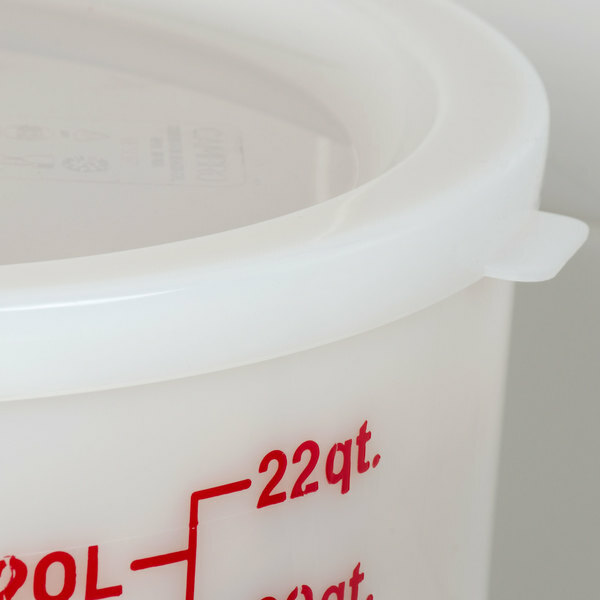 The top of the lid does dip down into the container so you do need to leave about an inch of air space before sealing the lid onto the container. Plain and simple, these are the lids we need for the buckets we need. Get the job done and hold a nice tight seal - sturdy and what you need! Must have. 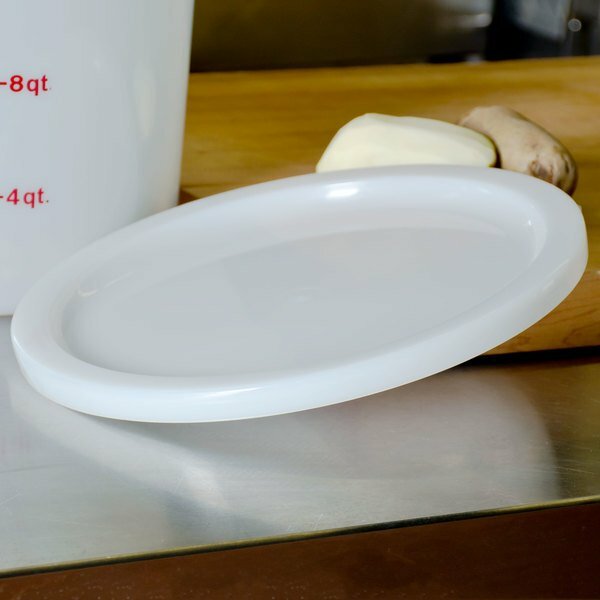 This cambro white round lid should be in your shopping list, do not try to use plastic wrap or anything cheap to cover your containers. The Cambro RFSC12148 22 At. Lid fits very tightly on the round food storage containers that I purchased from Webstaurant. 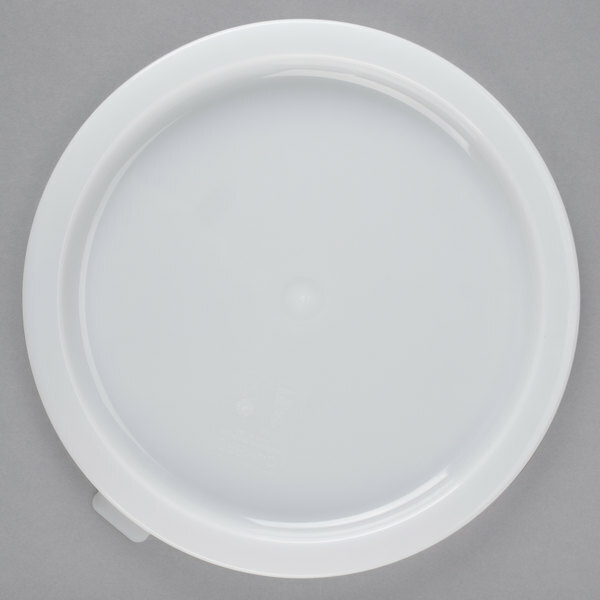 If you are looking for a lid that fits nice and secure then try this lid. The lid is a complementary piece to the 22qt. 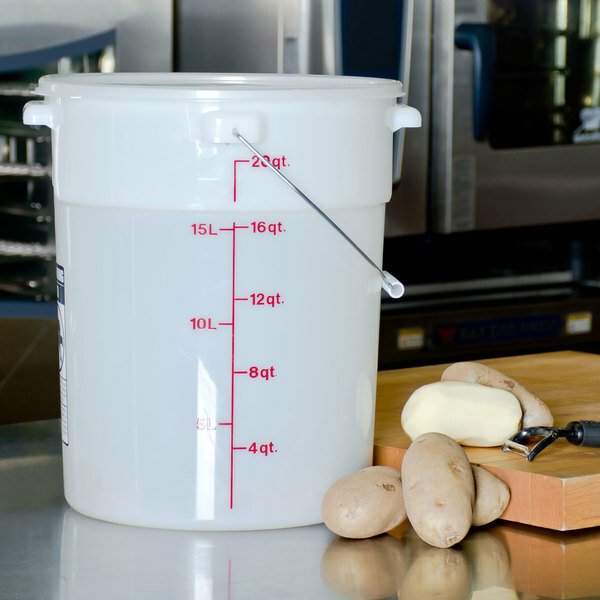 storage container It is a very solid lid that gives a good tight seal to the conainer. While I have not tipped all the way over, I have not had any leaks or anything from it. A must have if you also get the container. 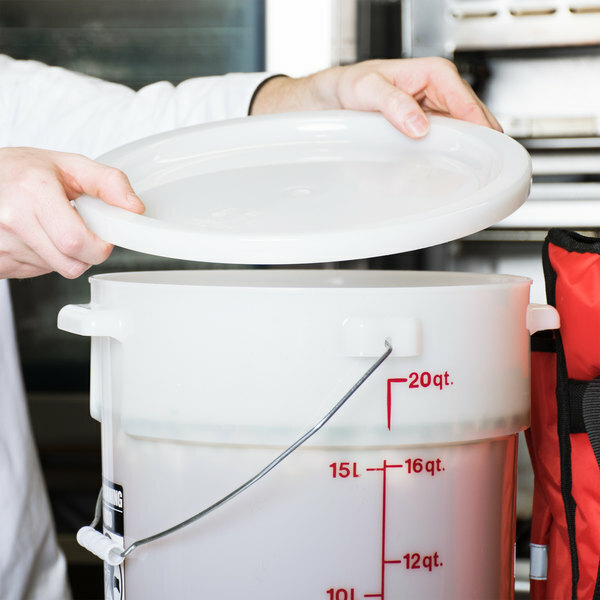 Having a lid for your cambro is a must. It makes storing them so much easier. I highly recommend using these. Easy to clean and durable. The lids fit the cambros snug enough to not leak out liquids. 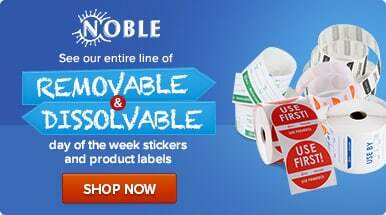 Date stickers stick to the plastic material very well, but is still easy to take off once you are done with them. Lid fits the bucket well, seats well but also removes without to0 much work. Made of a really high quality plastic. And there is a tab to make removing it easier which is nice. Snaps on tightly for a nice seal! Not hard to take lid off like some others I have had. Little flap on side makes it much easier.